Topps released a special edition Ben Zobrist card today available only on the Topps website. The card, although similar to Topps NOW in that it’s being offered for 24 hours, is not part of the Topps NOW set. There’s also an additional perk available to those that purchase the card from Topps. 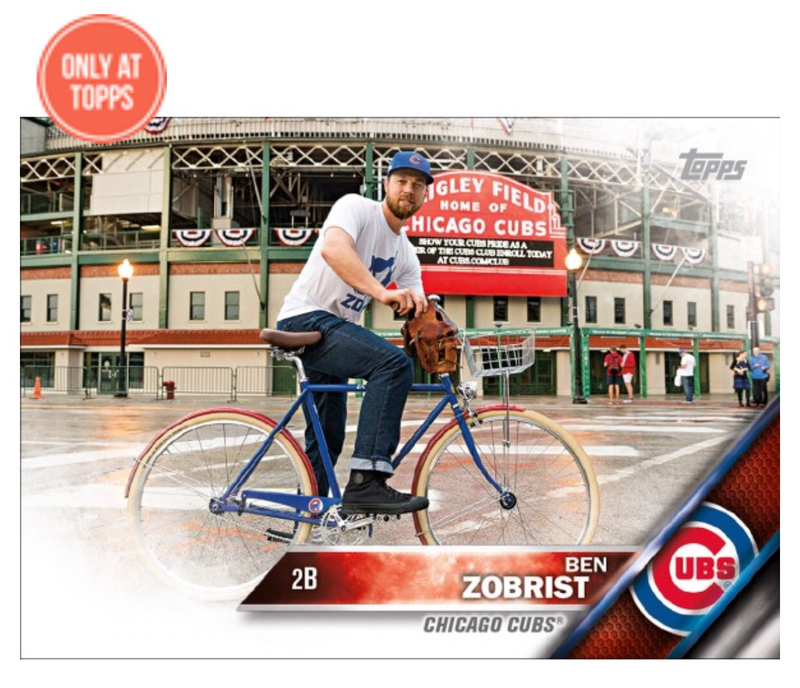 Each card purchased will give buyers an entry into a sweepstakes to win a replica Ben Zobrist Custom Bike. Purchase this special edition card* and you will automatically be entered for a chance to win** a replica Ben Zobrist Custom Bike. Ben designed his original bike with the Playoffs in mind and rides it to and from the field. One winner will be randomly selected after the 2016 Postseason® has ended. All Net Proceeds from the sale of this special edition card will be donated to Patriot Forward. Photos courtesy of Stephen Green. For more bike info, please visit @benzobrist18. *BY PURCHASING THIS CARD VIA TOPPS.COM AND PROVIDING YOUR CREDIT CARD INFORMATION AND EMAIL ADDRESS, YOU (1) ACKNOWLEDGE THAT YOU WILL BE AUTOMATICALLY ENTERED INTO THE SWEEPSTAKES AND (2) EXPRESSLY CONSENT TO TOPPS’ OR ITS AGENT’S USE OF YOUR EMAIL ADDRESS TO CONTACT YOU REGARDING THE SWEEPSTAKES. YOU FURTHER ACKNOWLEDGE THAT THE NET PROCEEDS FROM YOUR PURCHASE WILL BE DONATED TO PATRIOT FORWARD. **ABBREVIATED SWEEPSTAKES RULES: NO PURCHASE NECESSARY. A PURCHASE WILL NOT INCREASE YOUR ODDS OF WINNING. Open only to legal residents of the 50 U.S. and D.C. who are 18+ at time of entry. Begins 10/20/16 at 02:00 PM ET and ends 11/04/16 at 11:59 AM ET. Subject to full OFFICIAL RULES available at http://cdn.topps.com/media/pdf/Ben_Zobrist_Sweepstakes_Rules.pdf One (1) Prize will be awarded. Enter online or by mail. Limit one (1) Entry per person per household. Void where prohibited by law. Odds of winning depends on # of eligible Entries received. ARV: $1,400. Sponsor: The Topps Company, Inc., 1 Whitehall Street, New York, NY 10004. Ever Wanted To See The Patent for the BGS Holder?